OK - not really single handing 'cause I'm not going anywhere. I'm anchored just outside Jolly Harbour trying to refinish the teak on the caprails. There is a Budget Marine handy so I can replace stuff as I break it. Guy rowed across the Atlantic in this. Saw this in the Post Office. Hmmmmm? Pam's back late Tuesday and then we start looking for weather to head down to Guadaloupe. 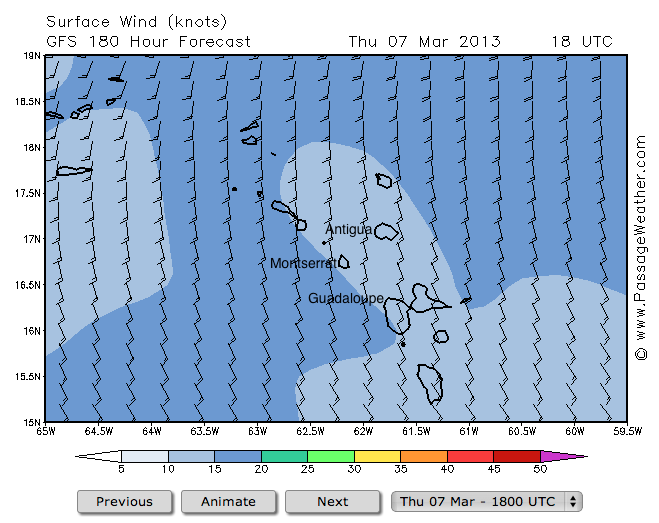 Look at the forcast for next Thursday... winds directly on the nose from Guadaloupe. Grrrrr. Maybe we're going to Montserrat? I hope you can keep your tears from falling on the Cetol as you work on the teak! Miss you too!